Coating a house in color so luscious it stops traffic is not something Henry and Rochelle Ford intended to do -- nor did they expect applause from their Palo Alto, California, neighbors. 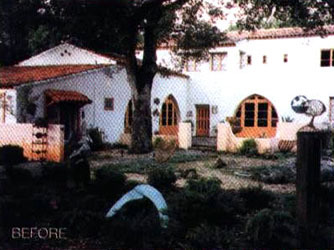 The Fords' Spanish hacienda-style home had been painted white since it was constructed in 1924 in the historic Professorville district near Stanford University. When the Fords moved from Connecticut to California 25 years ago, they were content with the plain-looking facade for a good long while. "During the first 17 years we lived in the house, we repainted the exterior white five times," Rochelle recalls. Out front, a coast live oak shaded a lawn identical to every other house on the block. 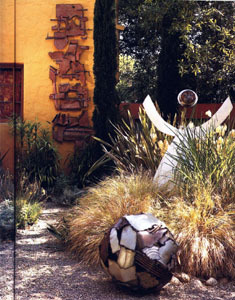 The plants and gravel paths combine to create an unassuming and easily maintained setting for Rochelle Ford's dramatic sculptures. Painting the stucco seating and walls surrounding the courtyard the same brilliant colors as the house transforms the space into a fresh and inviting extension of the home. [It's]so luscious it stops traffic is not something Henry and Rochelle Ford intended to do -- nor did they expect applause from their Palo Alto, California, neighbors. 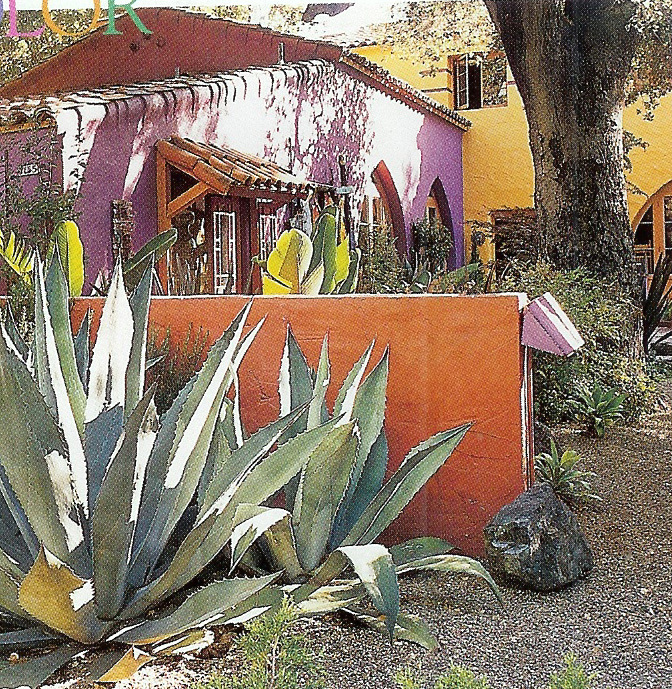 The Fords' Spanish hacienda-style home had been painted white since it was constructed in 1924 in the historic Professorville district near Stanford University. 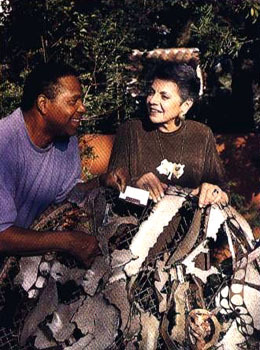 Rochelle and her husband, retired Pittsburgh Steeler Henry "Model T" Ford, move a sculpture created from a discarded outdoor tabletop. The make over started with the lawn. 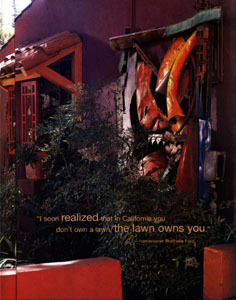 "When we moved here, I soon realized that in California you don't own a lawn; the lawn owns you," Rochelle explains. Embracing the reality of living without rain for six months at a time, the Fords converted their front yard to drought-tolerant ground covers, such as juniper and lavender surrounded by grounded mulch. "The day we took out the lawn, we shifted from being Easterners to Westerners," Rochelle says. "Instead of watering an hour a day, we water an hour a week". The landscape still looked ordinary--"a sea of gravel and junipers," according to landscape designer and family friend Richard Wogisch--but replacing the lawn shifted the way the Fords thought about their home. Then a seriously ill friend of Rochelle's imparted some life-changing advice: "You've always talked about wanting to be an artist. Do it now; you don't know how much time you have left". When Wogisch saw the newly painted house, the vivid colors so inspired him that he volunteered a make over for the front yard. "All I did was try to get it organized", he says. 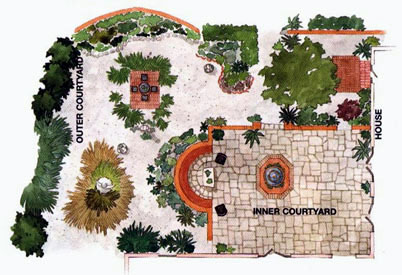 His design grouped existing plants into distinct areas--succulents in one bed, grasses in another--while adding easy-maintenance specimens, such as sago palm, (Cycas revoluta), bronze New Zealand flax (Phormium tenax 'Atropurpureum'), and Spanish dagger (Yucca gloriosa), to provide year-round sculptural drama and foliage color. Left over roof tiles became the curved edging for a raised bed. And, of course display platforms for Rochelle's sculptures were part of the plan. To separate the yard from the street, Wogisch designed a series of stucco walls, some of which echo the shape of the home's arched front windows. One wall section is taller than the rest to provide maximum screening from the street. A curved section does double duty as a seating area, and two shorter portions, which end in waist-high square pillars, create an entry to an eclectic outdoor living space. A square trimmed hedge extends the wall to the yard's front entry. With design in hand, the Ford's did almost all the yard renovations themselves; Henry built the stucco wall with help from son Michael. It's all in the details: a sculptural element dresses a wall. 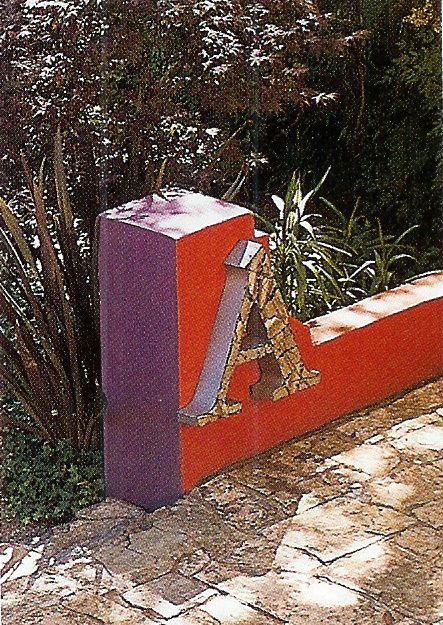 At the main entrance from the street, cactus adds a dramatic sculptural note while complementing the riot of paint colors with it's calm gray-green foliage. 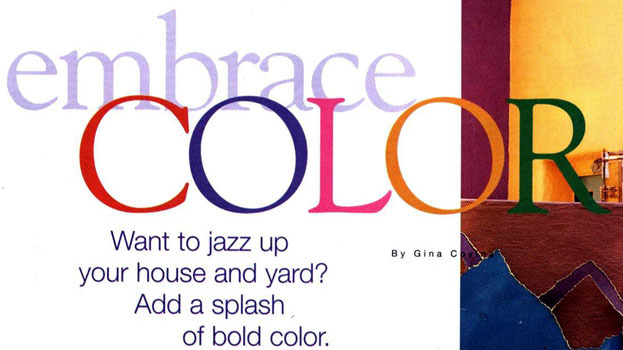 Two simple strategies tie the yard's elements into a single dazzling package, and both depend on color. 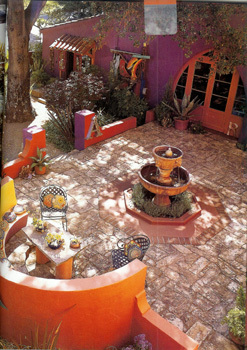 First, the vibrant hue's of the home's exterior extend into the yard to cover the courtyard walls and seating. 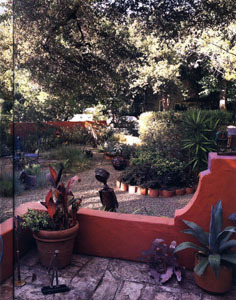 Additionally brightly painted accents include a blue table-and-chair set, red-framed window at the entrance to Rochelle's studio, and the turquoise front door. Second, the plant palette steadies and softens the extravagant color with its quiet range of blue, silver, and bronze foliage. Using evergreen steady performers such as Italian cypress (Cupressus sempervirens) and heavenly bamboo (Nandina Domestica) along with low-growing lavender cotton (Santolina chamaecyparissus) and Artamisia 'Powis Castle minimizes variations in the landscape resulting from seasonal changes. It's the reverse from the usual formula, in which a bland house is offset by flowering plants. The advantages are a flamboyant yet sophisticated show that continues year-round and plantings that are easy to care for. 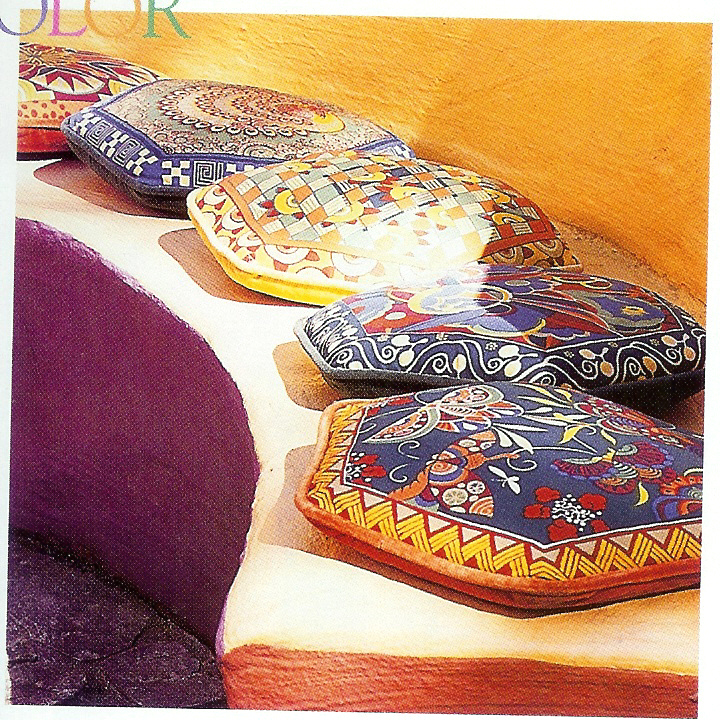 Rochelle painted the courtyard's semicircular banquette in the same trio of colors as the house, and sewed hexagon-shape pillows from fabric inspired by Spanish tiles. A whimsical kitchen step stool stands in as a planter for succulents. 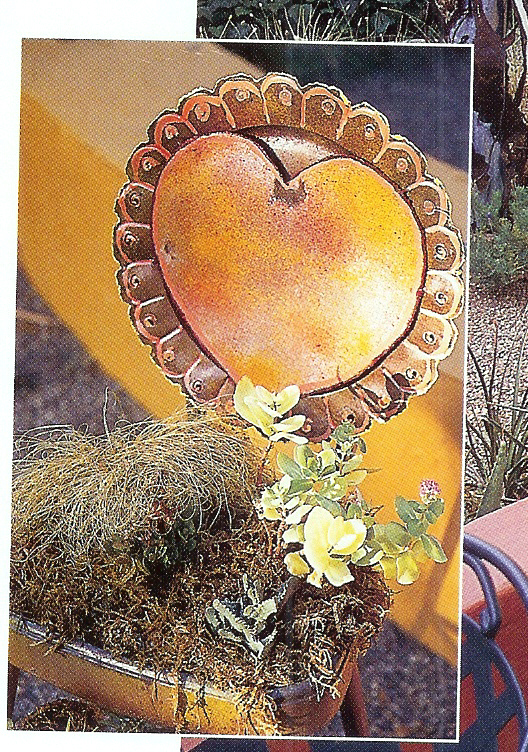 The garden angel rises from a former life as a water heater. In the foreground, old wine-barrel stays covered in metal scraps make a striking postmodern interpretation of a gazing ball.